One of my favorite things about the work I do is that I am constantly discovering and connecting with other creatives — and one of my very favorite things is collaborating with them, whether it's a styled shoot with other wedding vendors or a branding project for another small business owner. I recently had the pleasure of working with Tory Baker Photography, a talented natural light photographer here in Denver who specializes in motherhood and family photography. Tory and I connected on Instagram a few months back, and I instantly fell in love with her style and the fact that she works with film. Naturally, I was thrilled when she approached me about rebranding! Tory captures everything from intimate portraits to everyday moments, and does so in an effortlessly natural style. With her neutral color palette and light, airy aesthetic, her photographs are the kind that instantly become treasured family heirlooms. Going into the branding project, my primary goal was to captured those core elements of Tory's work — to create something delicate, timeless, and graceful. Our mood board for the project might be one of my favorites to date! With such light and lovely inspiration, Tory's new logo design ultimately developed very naturally. Since we wanted her branding to feel both organic and classic, we opted to combine a delicate, hand-lettered script with a more structural (but still very graceful!) serif font. 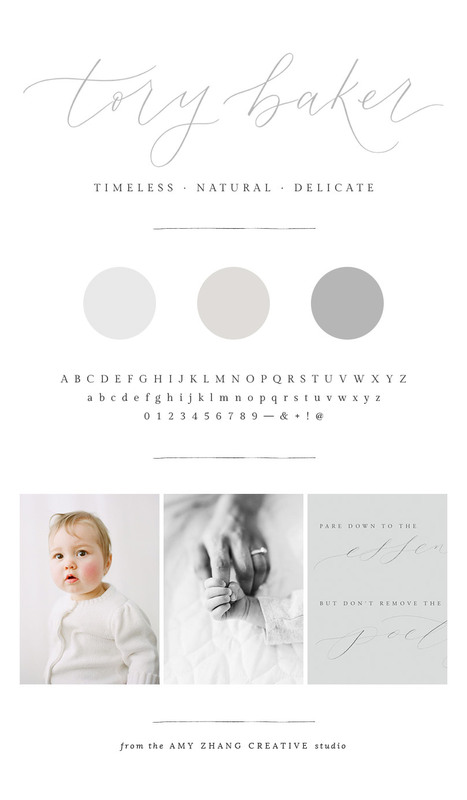 A neutral color palette was a must, and the soft tonal grays that we chose are a beautiful complement to her work. The final product is a brand experience that allows Tory's photography to shine — that evokes the feeling of quiet family moments and highlights the loving memories that she captures for her clients. Are you ready to get started on your branding project? I'd love to work with you! Fill out an inquiry form to get started with the process.